Look at that cute face…what’s not to love? 1. The echogenic bowel seems to be better. 2. Even though I’m measuring 20w4d instead of 23 weeks, there was some growth since the last visit. Usually, anything more than 2 weeks is abnormal. 3. The vasculature (doctor speak for heart blood flow) was better. Not ideal, but better. 4. The baby was moving like a maniac so getting it to stay still for pictures was tough. Busy already. Now for the reality check. The placenta is about double the thickness that it should be, which is likely the culprit for the slow growth. At some point, Dr. Harstad suggested, the baby will stop growing because the placenta won’t be doing the best job of supplying needed nutrients to the baby. 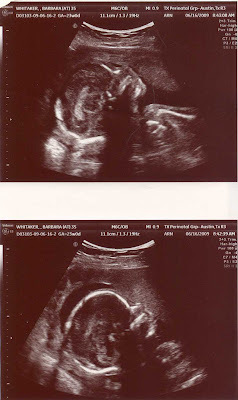 I go back in 2 weeks for another ultrasound and we’ll check the growth. As long as the baby is growing and we don’t see signs of distress and I don’t notice any bleeding, then we hold off on inducing labor. But, he did caution us that an earlier delivery, by c-section, is very likely. At each ultrasound we’ll know more about how much longer Baby Whitaker gets to camp out in my belly. Ideally, we want to make it to 30-32 weeks. Right now, I’m 23. Dr. H is a rip the bandaid off kind of doctor and his bluntness today didn’t freak me out as much as it did 3 weeks ago. I’ll spare you some of his candor 🙂 But I know this, he insisted that we see him for any follow-up visits. He wants to see our case through. And, the guy is superhumanly smart. So, I’ll take the after effects of the bandaid if he knows what he’s doing. Certainly the biggest bonus of today was seeing the baby again – looking so healthy and busy and happy. We already have names picked out – aren’t you impressed? We’re notorious for waiting until delivery to do that. Guess God is preparing us. Can anyone say “Sonic Happy Hour”? Oh Katherine. I'll keep storming heaven. God bless you guys. That is one beautiful baby. Love the pics of BW!! While the news is not what you would want to hear, it is definitely better than some of the options they ruled out! We will keep praying and sending out positive thoughts. Can't wait to hear the names! Katherine, y'all are in our prayers! Great pics, even if Baby W was super wiggly!! That is one cute niece/nephew! We love this baby so much already. We are cheering him/her on to "grow baby grow!" We're keeping God busy listening to our prayers for Baby W and your entire family. Your faith, family, and friends will sustain you. Hugs from the Fogarty's!